This afternoon for about an hour I stuffed all of the eggs for Leila's Easter egg hunt in the morning, and stuffed a whole other set of eggs for the Easter egg hunt we're having for our nieces in the afternoon. It was weird and oddly exciting being the one who actually stuffed the eggs! 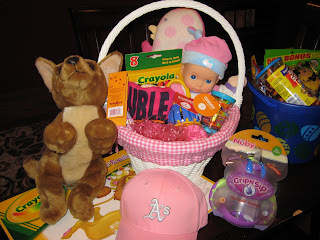 Then, for the last fifteen minutes or so I put together Leila's and Ramon's Easter baskets. 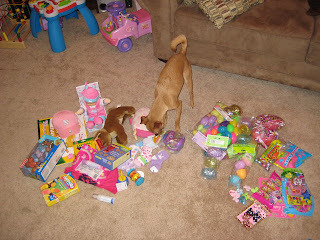 Leila made out like a bandit! She got her first baby doll, which seems entirely appropriate since she started saying "baby" this week, she got two stuffed animals - a chihuahua, and a cute pink bird that I couldn't resist from Pottery Barn Kids, a t-shirt, her first set of jumbo crayons with a coloring pad, a pink A's baseball hat, a new sippy cup and some fun toys from Gymboree Play and Music! Ramon didn't do quite as well, but managed to get some tasty treats! 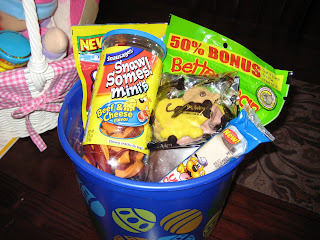 I can't wait until tomorrow morning for the egg hunt, and to see how Leila likes her new goodies! Stay tuned for those pictures! I love both of the babies baskets. Belle is going to be jealous of Ramon's basket. Too cute. It is a weird transition to be the "basket stuffer", but so much fun.